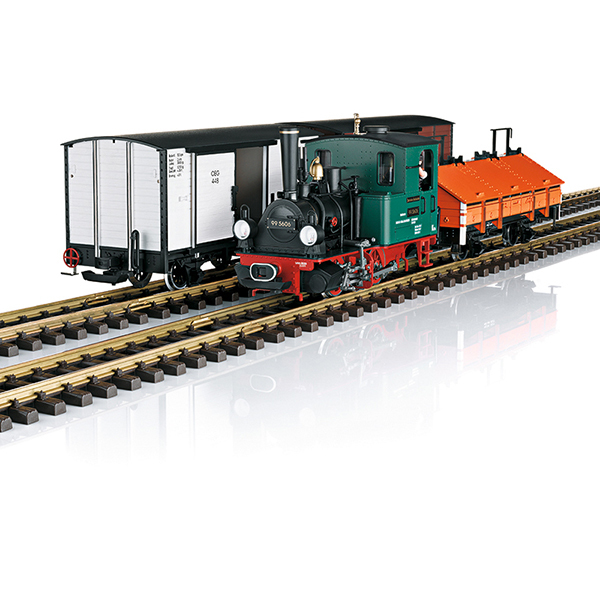 Model: This is a model of the so-called "Factory Train", as it stood for many years in front of the Nürnberg LGB plant on Saganer Street in Nürnberg. 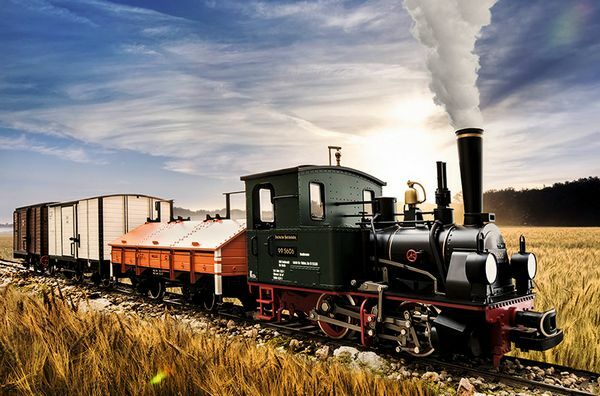 The train consists of the steam locomotive, road number 99 5606, in the prototypical paint and lettering for the Seventies. Locomotive builder plates of etched metal are separately applied. The locomotive has a powerful ball bearing mounted Bühler motor and an mfx/DCC decoder with many digitally controlled functions and sounds. It also has a built-in smoke unit with steam exhaust synchronized to the motion of the wheels. Digitally controlled headlights change over with the direction of travel and are turned on in analog operation. The locomotive has digitally controlled cab lighting. The running sounds will work in analog operation. The two-axle gondola with hinged hatch covers is prototypically painted and lettered for the Seventies. The car has a separately applied brake wheel for the hand brakes. The two-axle boxcar, car number 448, is prototypically painted in white and lettered for the Seventies. The car has a separately applied brake wheel for the hand brakes and a prototypical arrangement of the brake shoes only on the inner surface of the wheels. The two-axle boxcar, car number 336, is prototypically painted in brown and lettered for the Seventies. The car has a separately applied brake wheel for the hand brakes and a prototypical arrangement of the brake shoes only on the inner surface of the wheels. Total train length 115 cm / 45-1/4".